The R. G. Casey building, head office of the Department of Foreign Affairs and Trade, in Barton, ACT. "Advancing the interests of Australia and Australians internationally"
The Australian Department of Foreign Affairs and Trade (also called DFAT) is a department of the Government of Australia charged with the responsibility of advancing the interests of Australia and its citizens internationally. It manages the government's foreign relations and trade policies. The head of the department is the Secretary of the Department of Foreign Affairs and Trade, presently Frances Adamson, who reports to the Minister for Foreign Affairs, presently the Hon. Julie Bishop MP, the Minister for Trade and Investment, presently the Hon. Steven Ciobo MP, the Minister for International Development and the Pacific, presently Senator the Hon. Concetta Fierravanti-Wells, and the Minister for Tourism and International Education and the Minister Assisting the Minister for Trade and Investment, presently Senator the Hon. Richard Colbeck supports the administration of the department. The department finds its origins in two of the seven original Commonwealth Departments established following Federation: the Department of Trade and Customs and the Department of External Affairs, headed by Harry Wollaston and Atlee Hunt respectively. The department was abolished on 14 November 1916 and its responsibilities were undertaken by the Prime Minister's Department and the Department of Home and Territories. It was re-established on 21 December 1921. Until the Second World War, Australia's status as a dominion of the British Empire in the then British Commonwealth meant its foreign relations were mostly defined by the United Kingdom. During this time, Australia's overseas activities were predominantly related to trade and commercial interests, while its external affairs were concerned mostly with immigration, exploration and publicity. The political and economic changes wrought by the Great Depression and Second World War, and the adoption of the 1931 Statute of Westminster, necessitated the establishment and expansion of Australian representation overseas, independent of the British Foreign Office. Australia began to establish its first overseas missions (outside London) in 1940, beginning with Washington, D.C., and now has a network of over 80 diplomatic (and 22 trade) posts. 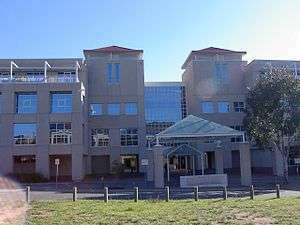 The Department of External Affairs was renamed the Department of Foreign Affairs in 1970, On 24 July 1987, the Department of Foreign Affairs and the Department of Trade were amalgamated by the Hawke Labor Government to form the Department of Foreign Affairs and Trade. In 2005, DFAT became embroiled in the Oil-for-Food Programme scandal after it was revealed it had approved the Australian Wheat Board's (AWB) request allowing it to pay 'trucking charges' to Alia, a Jordanian trucking company with no actual involvement in the trucking of Australian wheat within Iraq. The Cole Inquiry into the AWB was established, however its terms of reference excluded any investigation of the role of DFAT. manage efficiently the Commonwealth's overseas owned estate. The department is responsible to the Minister for Foreign Affairs and the Minister for Trade and Investment; currently Julie Bishop and Andrew Robb, respectively. The Minister for Foreign Affairs is also assisted by a Parliamentary Secretary. The department has a staff of around 3,300 employees, of which 1,300 are foreign staff employed by missions directly, and 1,500 are Australian employees based in Australia, and some 500 are diplomats serving overseas. The department maintains offices in each state and mainland territory to provide consular and passport services, and to perform an important liaison service for business throughout Australia. In addition, it has a Torres Strait Treaty Liaison Office on Thursday Island. Additionally, the department manages a network of over 90 overseas posts, including Australian embassies, high commissions, consulates-general and consulates. ↑ "Frances Adamson - Biographical details". Department of Foreign Affairs and Trade. Commonwealth of Australia. 3 December 2012. Retrieved 28 October 2013. 1 2 3 "History of the Department". Department of Foreign Affairs and Trade. Retrieved 2007-08-08. ↑ "What We Do". Department of Foreign Affairs and Trade. Retrieved 2007-08-08. ↑ "Administrative Arrangements Order" (PDF). Department of the Prime Minister and Cabinet. Commonwealth of Australia. 18 September 2013. Retrieved 27 October 2013. ↑ Hawke, Bob (23 July 1987). "For the media". Department of the Prime Minister and Cabinet (Press release). Commonwealth of Australia. Retrieved 10 November 2013. 1 2 Hawke, Bob (2 June 1988). "For the media". Department of the Prime Minister and Cabinet (Press release). Commonwealth of Australia. Retrieved 10 November 2013. 1 2 Hawke, Bob (8 November 1991). "For the media". Department of the Prime Minister and Cabinet (Press release). Commonwealth of Australia. Retrieved 10 November 2013. ↑ Keating, Paul (14 May 1993). "Dr Peter Wilenski AO". Department of the Prime Minister and Cabinet (Press release). Commonwealth of Australia. Retrieved 10 November 2013. ↑ Keating, Paul (26 May 1993). "Appointment of Departmental Secretaries". Department of the Prime Minister and Cabinet (Press release). Commonwealth of Australia. Retrieved 10 November 2013. 1 2 Howard, John (8 March 1996). "Statement by the Prime Minister designate, The Hon John Howard MP". Department of the Prime Minister and Cabinet (Press release). Commonwealth of Australia. Retrieved 10 November 2013. 1 2 Howard, John (2 December 2004). "Dr Ashton Calvert AC". Department of the Prime Minister and Cabinet (Press release). Commonwealth of Australia. Retrieved 10 November 2013. 1 2 Rudd, Kevin (13 August 2009). "Departmental secretaries and statutory office-holders, Canberra". Department of the Prime Minister and Cabinet (Press release). Commonwealth of Australia. Retrieved 10 November 2013. 1 2 Gillard, Julia (17 September 2012). "Diplomatic Appointment and Appointment of Secretaries of the Department of Defence and the Department of Foreign Affairs and Trade". Department of the Prime Minister and Cabinet (Press release). Commonwealth of Australia. Retrieved 27 October 2013. ↑ "Mr Peter N Varghese AO - Biographical details". Department of Foreign Affairs and Trade. Commonwealth of Australia. 3 December 2012. Retrieved 28 October 2013. ↑ Doran, Matthew (20 July 2016). "Frances Adamson appointed as DFAT's first female secretary". ABC News. Australian Broadcasting Corporation. Archived from the original on 5 August 2016. ↑ Mannheim, Markus (20 July 2016). "Frances Adamson becomes Department of Foreign Affairs and Trade's first female secretary". The Canberra Times. Fairfax Media. Archived from the original on 17 August 2016. ↑ Turnbull, Malcolm (20 July 2016). "Ms Frances Adamson appointed Secretary of the Department of Foreign Affairs and Trade" (Press release). Australian Government. Retrieved 18 August 2016.